Conventionally, people engage with I-Ching by formulating a question and consulting for answers. Yet the guidelines I provided to craft an inquiry is a self-reflective process without formulating any specific question. Why? On the surface, asking a question is a perfectly valid way to engage with I-Ching. However, if we zoom into the finer nature of how we hold questions in the system of self, then a wide spectrum reveals itself. This spectrum is defined by two kinds of questions, involving two distinctly different cognitive pathways. The first kind demands an answer. Not just any answer, but the right answer. Our schooling primarily uses this kind of question to train us in essential skills such as spelling and math. Professional realms such as engineering, accounting and western medicine are giant knowledge pyramid built upon this kind of question. Skills for finding the correct answers for these questions are the bedrock of the construction of self-identity in modern society. This way of asking and answering questions also profoundly shapes how we experience our life situations. How can I proceed in the right way towards X, when X ranges from security to success, love to being loved, societal harmony to spiritual enlightenment? This dualistic way of asking a question usually reflects a deep unfulfilled need, often not completely transparent to our conscious awareness. I call this kind of question the need-based question. Fulfilling these needs is a foundational aspect of our life journey. It prepares us the necessary skills and capacities for the second kind question. The second kind of question has no answers in the domain of known reality. These questions are asked by explorers who have traveled to the edge of known reality, ready to jump into the mystery of the unknown with their whole being. Because these questions are pointing to territory not yet mapped by our known knowledge, there is also no way to apply the distinction of right or wrong, good or bad. Furthermore, the questions themselves are most likely not definable by words, as beyond the edge of known reality, the full nature of mystery is no longer encoded by language. Not even words we use to point to mystery are sufficient to convey its infinitely rich texture, nuance and changing dynamic. Yet the trajectory carved by these explorers’ very being, their sheer presence, their way of life, is the question itself. I call this type of question the Explorer’s Question. The Explorer’s Question, when issued from a solid foundation where the necessary needs are fulfilled, is an organic, natural expression of a totally open and supple state of mind. It is like the utter curiosity of an infant with no preconceived notion about the world unfolding around her. While infants do not have the capacity to harness the power of this curiosity into productive creativity, this exquisite state of mind, when held by a grown-up, can be the most virile spark that impregnates the fertile present moments, giving birth to unfolding emergence. I-Ching in its deepest core is intended as a map-making device to serve the Explorers in their expedition into the unknown, the mystery of emergence. We will not get the answer we seek if we only ask I-Ching need-based questions. It is simply not the right tool. Just like a state-of-art telescope is not going to help with near-sightedness. For near-sightedness, we need to a good pair of prescription glasses. At the same time, it is essential for us to investigate the kind of need-based questions arising in a situation. Those questions point to inner needs that must be fulfilled to provide a solid foundation, a well-stocked base camp from which we can launch our expedition into the unknown. In order to carry out an enjoyable and fulfilling expedition, we want to prepare our inner self for the risks inherent in any serious engagement with the unknown. Every situation we are interacting with inherently contains both kinds of questions. Some people are more naturally attuned with one kind of question than the other. Some situations lend themselves more readily to one kind of question than the other. We want to cultivate what is natural for us, while stretching our capacity to hold the kind of question that does not feel natural for us. The Explorer’s Question is not always available to us in verbal form. That is why I don’t think it is necessary to formulate the “right” question in words. And, I would caution not to construct an Explorer’s Question in words before one is quite ready for it. Before every expedition, there is usually a long period of preparation to store up necessary resources and stamina. Instead, we can trust that our mere living, our sheer being, in itself is a question, with or without our conscious knowing. 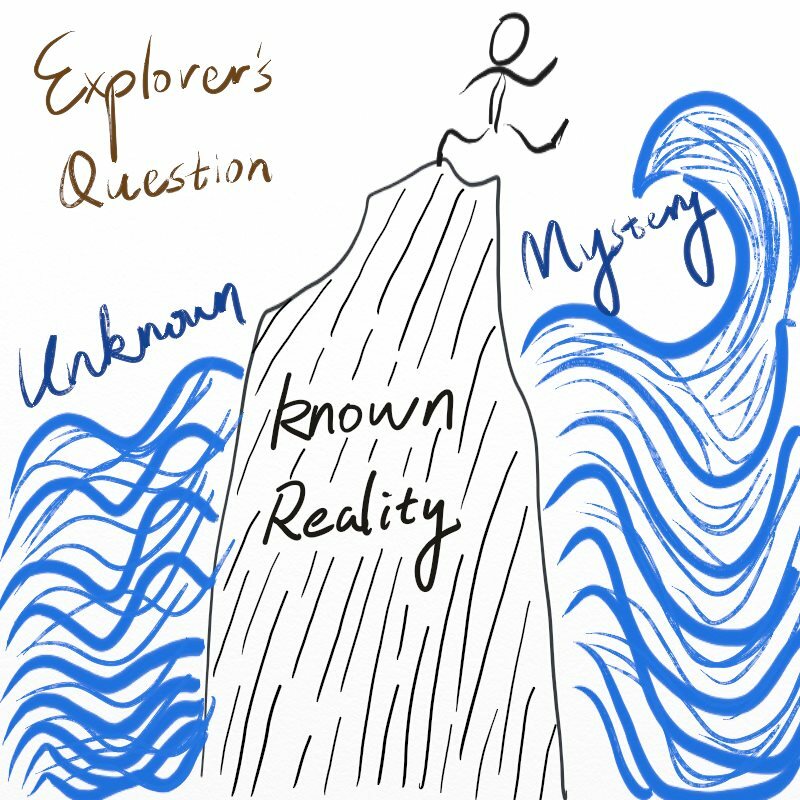 The Explorer’s Question that our lives embody will come to seek us and reveal itself to us. When that happens, our whole being will know it as every cell of our body will resonate with the vibration of this question. At the same time, examining the need-based questions that naturally float in our mind, without censoring or suppressing them or making them right, will help us uncover invaluable resources. This is our attention that has been frozen in reactive patterns. As we have discovered with the five-element exercise, quite a bit of our attention is spent reacting from fear, pain, grief, desire or obsession for a perceived “better” future. These patterns point to places inside of us where we need to unfreeze our attention into a more free-flowing form. Curiosity, play, and the freedom to improvise, make “mistakes”, or take a fall are all aspects of a healthy stream of free-flowing attention. As we have discussed in the essay of Attention as Resource, free-flowing attention, as a form of resource, is becoming increasingly limited in our modern culture. We are not short of attention, but most of our attention is trapped in concretized reactive forms. There is limited amount of open curiosity to make a substantial “investment”. In today’s world, many of us do not have shortage of great ideas and meaningful purpose that are worth investing our life energy in. Yet as the pace of life gets faster and faster with more and more things to accomplish, most of us feel the restriction of limited attention. It would be like discovering our inheritance includes an old house, yet we don’t have enough funds to develop it into a profitable real estate. Yet with this following question, we can take a different stance and turn this challenge into a great gift. How do we recycle the attention trapped in reactive patterns into free-flowing form to invest in our creative action and choices? 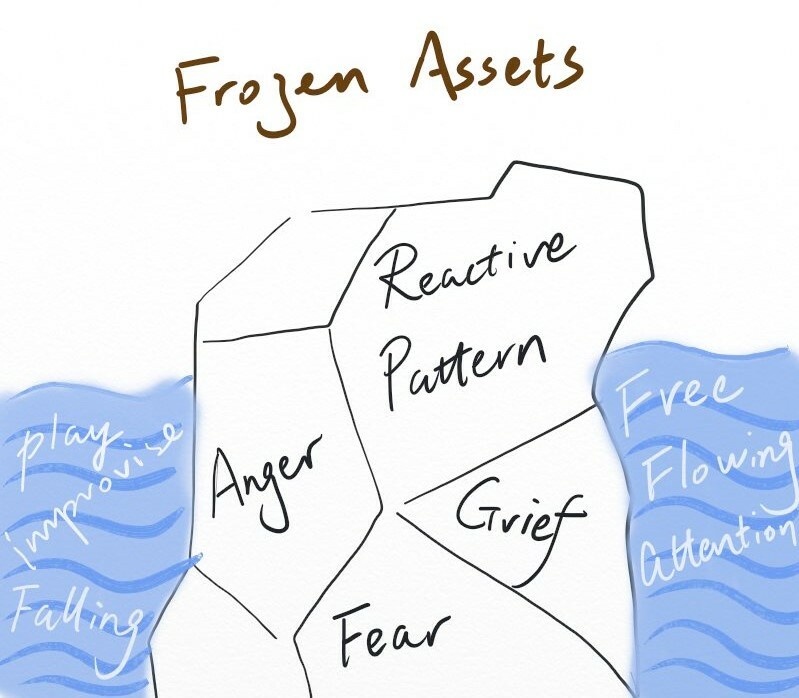 Here we take the stance that these reactive patterns as our “frozen assets”. We all have access to a great amount of “frozen assets” inherited from our past, our family, and cultural forces that have shaped us. With the right knowledge, skills and practice, we can regenerate them into real assets to enrich our lives in ways that truly matter to us. The exercises we have introduced so far are intended to develop a cognitive pathway to illuminate reactive patterns underlying our inquiry. Therefore, we can claim our inheritance. In the next part of our course, we will be introducing several techniques that allow us to free our attention from the reactive patterns. We will also examine some basic concepts and practices in making an investment with our free-flowing attention. Ronald Heifetz in his book Leadership Without Easy Answers also makes a similar distinction between technical challenges where the problem is known and the answer is knowable by reference to past knowledge versus “adaptive challenges” where neither the question nor the answer is known and this requires the kind of inquiry Spring is teaching to gradually learn what might be a good question and learn what might be a good answer. The objective in asking and answering technical questions is solve the problem quickly, to get an answer. The objective in inquiry is to unconceal what you didn’t know you didn’t know. Thank you Joseph, those are inspiring parallel reflections! So beautiful, Spring. Revealing yet again, how parallel our spirits/minds/hearts are. What you’ve said and pointed to, is active within me also, and in fascinatingly different words! I can’t rephrase it all now into my own words, but just an hour ago, I posted this exchange in an online community I’m a member of, and perhaps the parallel framing and inquiry can be discerned. But if someone has enough, isn’t enough really enough in the mind ? Or maybe that person is operating from the fear and scarcity core belief that whatever she has, it’s still not enough. Not enough for what ? Not enough to feel good, be happy and free of fear and stress ? “More” is the program installed through schooling, media communications and the scarcity beliefs of others. If we always want more, if having enough is not satisfying, we create fear – a fear that if we don’t always hanker for more, we will not have enough in the future. ….. So when we are situated in our hearts instead …. there is only bliss and the manifestation of whatever is needed in each moment of now. Simply by generating the feeling of always having enough – with gratitude and appreciation as a state of eternal beingness, as an absolute – you are established in the mystical, the Divine, the freedom of the soul. Thinkers will call you a fool; whereas, the knowers and manifestors will celebrate your good fortune. You have such a way of expressing things that makes them FEEL clear and simple, the clarity and simplicity of non-languaged truth we might call “is-ness.” It reaches me, and I am sure others, very deeply, opening attention, opening breathing, opening windows inside, unfreezing some of that frozen attention/assets. Thank you! I think I can say it more briefly. The inquiry I’m living these days is: If the manifest universe (object of our attention) blinks in and out of existence zillions of times each nano-second, as some spiritual and scientific folks assert, then several questions arise (these could be all the same question): What brings it back, and why/how does it come back a different universe from the one that just went out of existence? What is it within a current universe that gives rise to what the next one will be? What is the bridging force?